Marking a significant break from the darker stories that DC has put forth in the past, Shazam! very astutely sheds the edginess and immense self-importance that plagued the likes of Batman vs Superman. It is a coming-of-age movie within a larger superhero movie. And it manages to look more than just convincing at that - it is a genuinely heartwarming tale that succeeds in making you feel, and making you laugh. 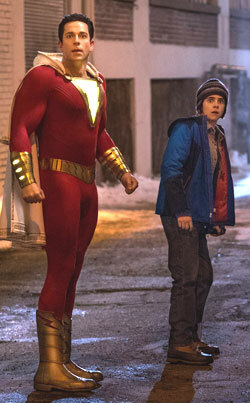 Swedish director David F Sandberg has tackled an entirely different genre this time, and handles Shazam! with the same expertise he showed in Annabelle: Creation which made him a fan favourite among horror enthusiasts. What makes this genuinely impressive is the fact that this is only Sandberg's third movie as a director. Shazam! is a journey of self-discovery (rediscovery?) of Billy Batson (Asher Angel) who has run away from foster homes several times in search of his birth mother, until a social worker hits him with that fact that she (the mother) wasn't looking for him - and that he should maybe give a chance to people who genuinely wanted to give him a good life. Plunged head-first into an oddball foster family featuring a couple who had been in foster care themselves, Billy finds himself living with five other kids of various ages, and strikes up a friendship with the disabled Freddy (Jack Dylan Grazer) despite his (Billy's) reticence and general unwillingness to let down his guard. Billy stands up for Freddy in the face of bullies, and turns to him when granted extraordinary superpowers by the aged wizard Shazam (Djimon Hounsou). Freddie becomes a hybrid sensei/sidekick to the newly-minted superhero Shazam (Zachary Levi), Billy's fully buffed, adult alter-ego, as he seeks to discover and master his newly-learned superpowers. On the way, he encounters his nemesis, Dr Thaddeus Sivana (Mark Strong), who is on a quest aided by the Seven Deadly Sins. An epic showdown at a carnival that hints at a potential sequel rounds up the thoroughly enjoyable experience that is Shazam!. Shazam! has plenty of things going its way, as it borrows from the Marvel formula of presenting well-made but lighter, humourous films with quirky yet relatable characters. Hell, DC even did two post-credit scenes on this one, all while not looking like a rip-off, which is commendable in itself. 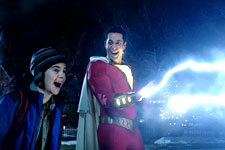 A strong script that takes its time to introduce fleshed-out, intriguing characters is perhaps Shazam! 's biggest strength. The film also ensures plenty of laughs throughout, with gags that feel genuinely funny. The movie is one of the rarer films that shows foster care in a positive light, and Sandberg provides you with a heartening, emotional ride in something that could easily be a Disney movie (think Herbie: Fully Loaded). The only negative we can think of is the unimaginative CGI portrayal of the Seven Sins, particularly in a fairly over-the-top reunion of Dr Sivana and his family. A couple of dark moments relating to both Billy and Dr Sivana's childhood (albeit in completely different ways) do catch you off-guard, but both instances are well-handled, maturely and emotionally. Zachary Levi is absolutely brilliant as the titular Shazam - it will be hard to imagine someone else more suited to that role. It really feels like Levi is a 15-year-old trapped in the body of an adult - he gets the mannerisms and expressions of a confused teenager down to the tee. Mark Strong does a decent job at being the villain, but he is still perhaps the weakest link in an otherwise on-point casting job. Asher Angel is great at projecting a swagger that masks his insecurities as a young Billy Batson, and is amply assisted by his foster brothers and sisters, mainly by Jack Dylan Grazer's Freddie. Grazer plays the perfect foil to both the troubled Billy and the goofy Shazam, and is snarky and delightful while at it. Djimon Hounsou is a veteran in superhero movies, and has now worked in multiple films for both Marvel and DC, and his portrayal of the wizard Shazam is confident, if not very cheerful. This reviewer was accompanied by a voracious comic book reader and long-time DC fan who pointed out that even though this wasn't the kind of movie that they would dwell on for a long period of time, it was still great fun during the (just over) couple of hours it lasted. Shazam! even managed to get them to chuckle at gags directed at Superman and Batman! Ultimately, it boils down to what you expect from a superhero movie. DC has shifted away from the darker, grittier narrative styles of its previous films to a more cheerful offering, one that has no qualms in not taking itself very seriously. Frequent chuckles in the movie theatre, and belly laughs at multiple moments, attest to the same. Shazam! is heart-felt, hilarious and disarmingly charming, but most importantly, it is a blast. Be the first to comment on Shazam! (Hindi)! Just use the simple form below. fullhyd.com has 700,000+ monthly visits. Tell Hyderabad what you feel about Shazam! (Hindi)!